Enter the extraordinary world of colorful sea life with this nighttime aquatic themed bedding collection. The comforter has a sweet little puffer fish with an interactive squeaker feature. The seahorse is a pretty blue corduroy fabric with aquamarine satin wings and our friendly octopus is a soft pique. 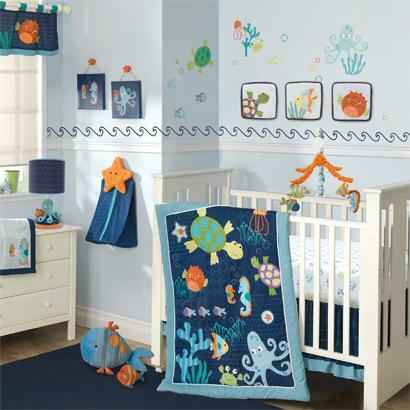 The unique diaper stacker has a starfish top and the two-piece wooden wall décor has a rope detail with starfish pegs. Adorable baby fishes swim in unison across the fitted sheet and a delightful octopus turns merrily on top of our musical mobile while his favorite fish swim below.